On August 9, 2009 Margarito Hernandez from Tutuaca, Chihuahua opened Pasturas Los Alazanes in Dallas, TX. Pasturas Los Alazanes is a local feed store that serves its community. Margarito moved to Dallas in 1996 where he lived on a 10 acre ranch and sold livestock, horses, goats and sheep. 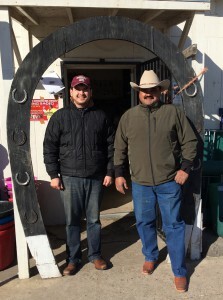 10 years later he opened Pasturas Los Alazanes a feed store focused on maintaining the highest quality of customer service, supplements and animal feeds. That’s why when you come to Los Alazanes there is always someone there to greet you with a smile and the enthusiasm to help. With more than 30 years of experience buying and raising animals, Margarito has transformed Pasturas Los Alazanes into the best place to find animal feeds containing the most advanced formulas to keep your animal healthy and performing at its peak. Los Alazanes also maintains the largest selection in the area of top of the line horse racing products. Margarito and his team at Pasturas Los Alazanes are always ready to take any questions please call us or come by the store. No matter what kind of animal your caring for, at Pasturas Los Alazanes there’s something for everyone.